Day of the Dead. What a morbid holiday. At least, that is what I thought before I arrived in Mexico last year just in time for the annual celebration of those who have passed. It didn't take long before I was totally hooked. So, one of my goals has been to embrace this time of year by participating in the tradition of building an altar. To this end, I have researched, talked to friends and family, dug through stuff and shopped. Realizing I was in a bit over my head, I contacted a Mexican friend who had teenage daughters for help. 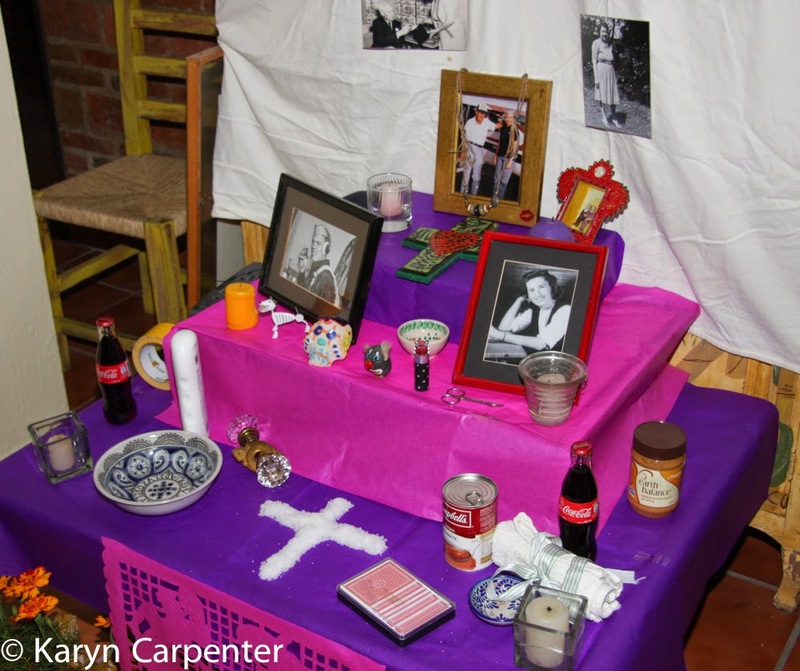 Not only would I get my altar, I'd get to know a Mexican family better. I win twice! After an initial visit to talk this through, Sergio and his daughters Fernanda and Andrea came to the house to help me assemble this tribute to my parents. Everything on the altar has a significance and a purpose. In reading online, I found a wide assortment of directions, but I followed the advice of my teenage teachers. In general you need three levels to your altar and they should be draped with crepe paper; a larger purple bottom one, a smaller pink level in the middle and a purple top level. Purple signifies mourning, pink celebration. Photos of the loved ones are placed on the alter. Since I wanted to include remembrance of my grandparents, we added images of them as well. A cross of salt is normally placed at the base, signifying the four directions and leading the departed to the altar. Candles, incense and marigolds are placed about, further helping the departed find their way back. Once the loved ones have returned, which happens for departed children on November 1 and for adults November 2, the souls need things to help them feel at home. A bit of water and a wash cloth is nice so they can freshen up after their journey. Their favorite foods and some of the things they enjoyed in life should be included. For Mom I included a necklace she enjoyed wearing, a can of tomato soup and a jar of peanut butter. There is a small figurine of a dog, a deck of cards and a set of doorknobs that were originally on the house that she and Dad built. Oh, and not to forget, a teeny pair of scissors to trim her nails, the ever important tube of red lipstick and a silly rock that has hair, a clown nose and big clown smile. For Dad there is a small bottle of Coke (and a separate one for Mom since he never shared his food). There is a radio so he can catch up on whatever he needs to catch up on, a Rotary ball cap, a roll of duct tape (because no man can survive without duct tape), a bottle of sun screen and one of vitamins. I should probably add a Discover card so he can get his 1% back on any purchases. 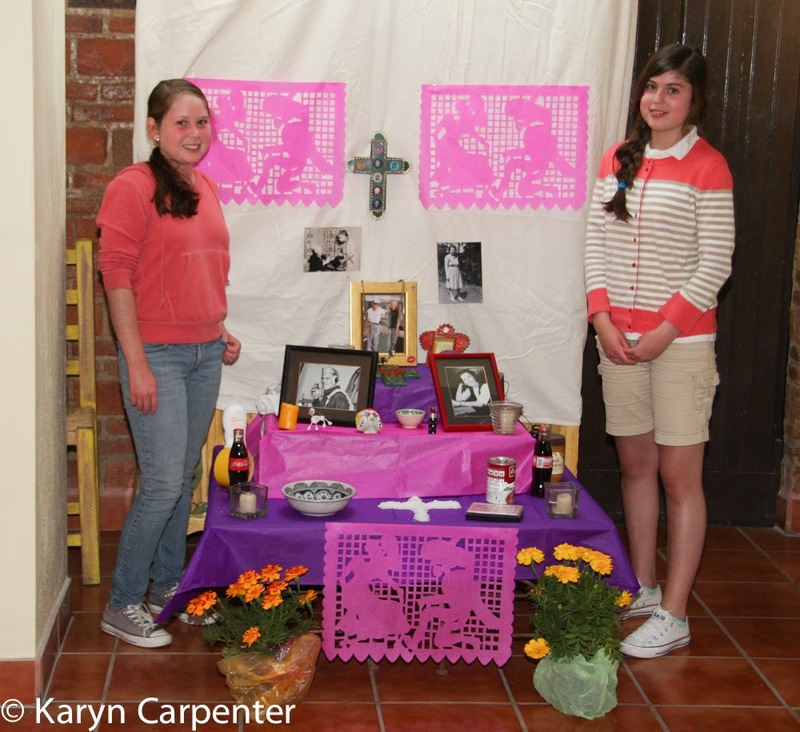 The Day of the Dead and building of an altar to honor loved ones is a lovely way to remember those who have played an important part in our lives. Consider trying on this Mexican tradition in your own home! Next year I am building an altar to my darling departed Newfoundlands! Oh, Karyn, I am totally hooked! Since I won't have time to assemble an altar for my father before November 2nd, I will fudge it a little bit this year and get one up before November 11 (what would have been his 82nd birthday). Mine too will include duct tape, but with some Penicillin and Charley Pride cassette tapes thrown in LOL Miss you so much!